If you don’t have a Windows installation disk (or bootable installation USB) you should. This Cloudeight freeware pick makes it easy to download a Windows 7, Windows 8.1, or Windows 10 ISO file from which you can easily create a Windows installation disk. Boot your computer in case you cannot boot normally. Access Windows troubleshooting tools like System Restore, Command Line (from which you can run disk check and System File Checker), and, in the case of Windows 8.1, System Refresh and System Reset, and System Reset in Windows 10. Our freeware pick is Windows ISO download – a simple too to use – and one you don’t even need to install – just download and run it. If you plan on using it more than one, it would be a good idea to pin it to your start menu and/or taskbar, or make a desktop shortcut to it. 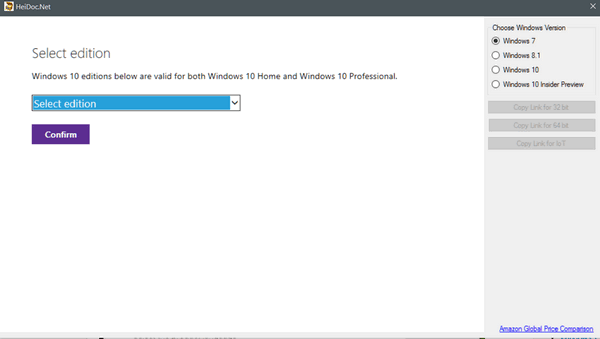 On the right, you can choose the Windows version for which you want the ISO file. Above I’ve chosen Windows 7. And below you can see all the ISO files available. Most of you using Windows 7 will want Windows 7 Home Premium SP1 or Windows 7 Professional SP1. 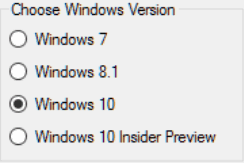 You can choose Windows 7, Windows 8.1, Windows 10, or Windows 10 Insider Preview. 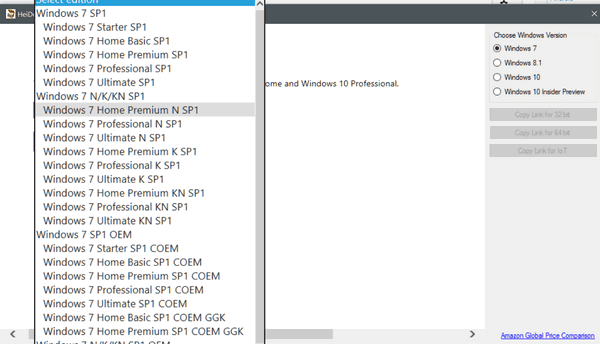 And you be able to choose from many different versions of Windows 8.1 and Windows 10, similar to the lists shown above for Windows 7. If you don’t have a DVD drive, you can make a bootable USB drive from an ISO, but you’ll need a freeware program to do it easily. See this page for more info on making a bootable USB from an ISO image. If you have a CD/DVD drive in your computer, we suggest you burn a DVD instead of a USB – unless you’re sure your computer’s BIOS is set to boot from a bootable USB. Having a Windows installation disk can be use to boot your computer, troubleshoot your computer when you can’t boot normally, and/or to reinstall Windows. You should have one. So there you go. That’s about it. You can download the Microsoft Windows ISO Download Tool from here. No tricks, no games. No install needed. Great freeware. Close program is the only choice. I even rebooted but still the same. Hi as always with software we have tested and recommend, we don’t make the software or provide support for it. It worked for us on 2 different computers. Additionally, there really is no reason to use ISO Downloader to download Windows 10. Microsoft offers its Media Creation Tool free of charge. Using the tool means you get the latest version of Windows 10 and all the updates in one file. If you need help with ISO Downloader, please contact its developer. Tried this free software for w8.1 and it downloaded to my Download folder, but when I looked at the folder the files in it were not iso files but regular files. Tried to move these files to my dvd drive but it just stalled. Any ideas of what might happened??? Thanxx for your response. I have no idea. I can’t tell by what you’re telling me – I would just reboot and pay attention to where it downloads. More importantly, you don’t “move” and ISO to a disc, you burn it to disc. Just putting the ISO file on a disk does not give you a Windows installation disk.An ISO image is a disc image. You have to burn it to a DVD. You would right-click on the file, with a writable DVD in the DVD drive, and click “burn to disc”.